Franco, Betsy. 2001. THINGS I HAVE TO TELL YOU: POEMS AND WRITING BY TEENAGE GIRLS. Photographs by: Nina Nickels. Cambridge: Candlewick Press. ISBN: 0-7636-0905-6. This collection of poetry written by teenage girls is a very profound and thought provoking collection that shares with the reader the obstacles, heartaches, and experiences young girls go through on a daily basis. This multicultural collection of thirty poems is a nice mixture of poetry and prose which resonate with adolescent girls. In this collection you will find “the hope, disillusionment, anger, joy, sadness, and most of all, the strength of young women today.” This young girls share their fears, dreams, relationships, and anguish. There is a minimal amount of sexual openness and cursing, but the talk is informal, tongue in cheek, straightforward, and sometimes angry or sad. School Library Journal states, “In allowing the words of teens from across the nation to shine through, without polishing or pushing, Franco has succeeded in compiling one of the brightest collections out there today.” With such poems as “Apricot Bath,” “A Bad Hair Day,” “Just Another Girl,” and “The Consequence of Loving Me” young girls will really be able to see themselves within the poems. Each poem is accompanied by a dramatic black and white photograph by Nina Nickles. According to Booklist, “They are never literal views of the words, but capture a diverse group of today's teenagers in all their various moods: as they cover up their secrets or celebrate being smart and strong or strut in the "Hallway between Lunch and English (Freud can kiss my sexually ambiguous arse"). Also included in the book is a table of contents, and author’s preface, and a preface and acknowledgement by the photographer. 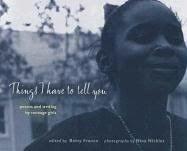 THINGS I HAVE TO TELL YOU: POEMS AND WRITING BY TEENAGE GIRLS is an excellent book to share with teenage girls. It is an outstanding collection that may help young girls while searching for their own identity.